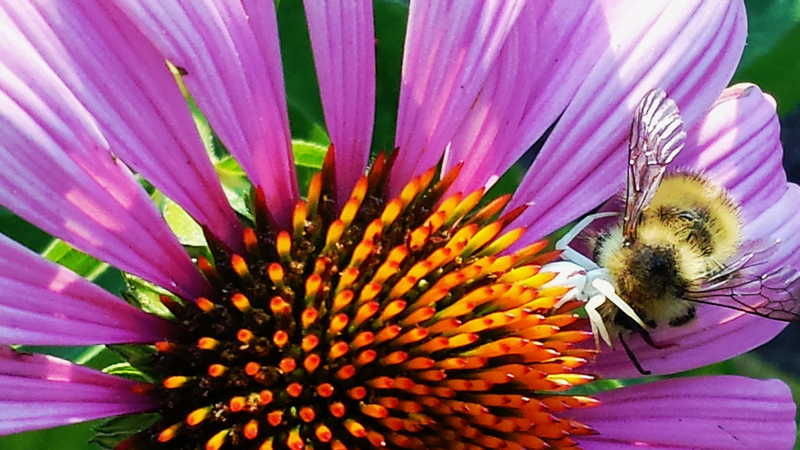 White Crab Spider Killing Bee. 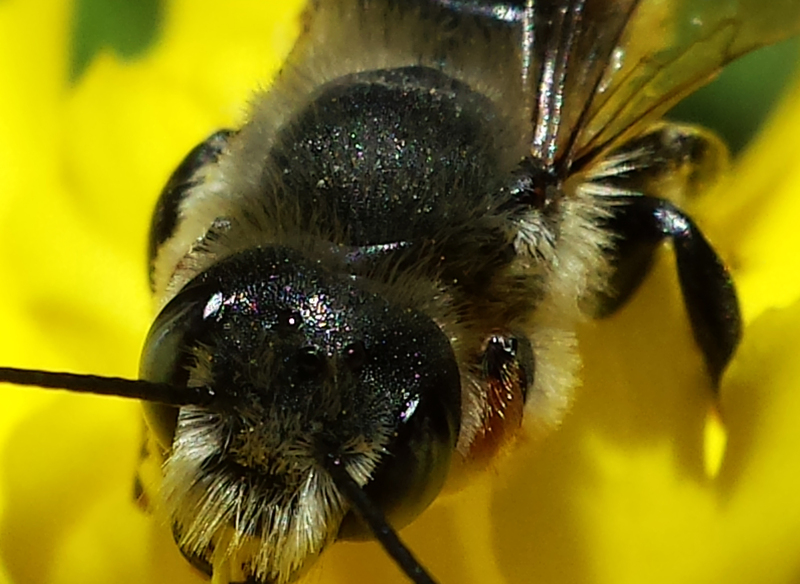 Maximum 4X magnification with Samsung Galaxy 4 cell phone camera. 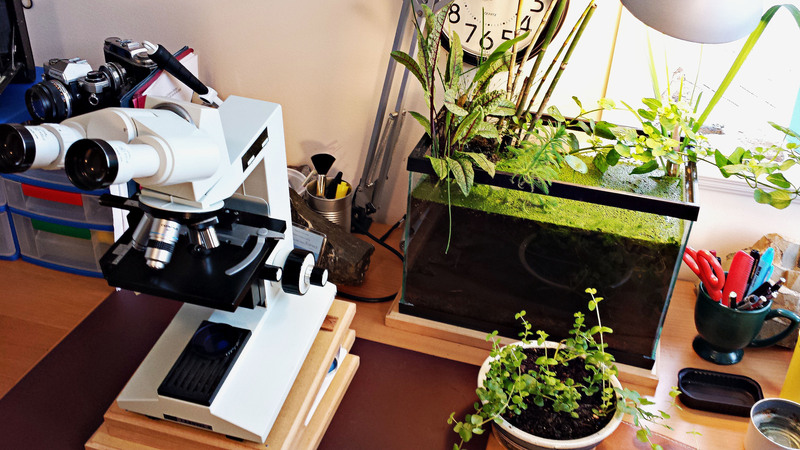 For photography of small plants, animals and fresh water creatures, there is a need for an intermediate level of magnification between a high camera macro setting (2-4X) and the lowest power available on the microscope (20-40X). 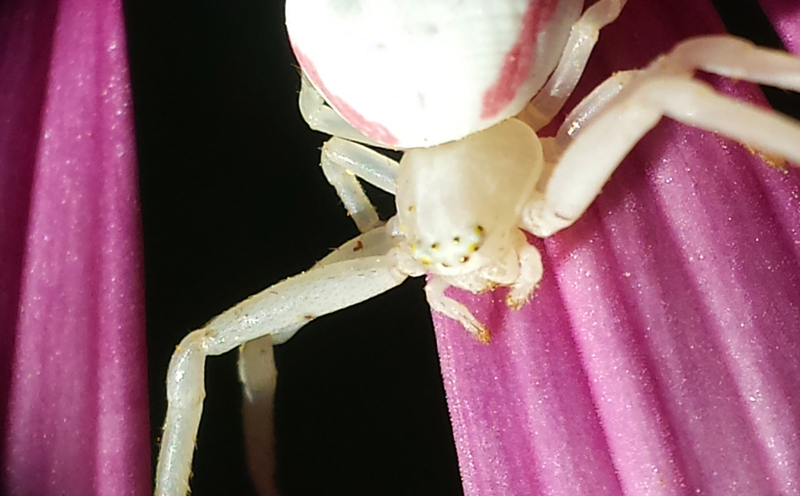 Furthermore, it is desirable if high-level macrophotography can be portable: traveling to the flower or the glass of the aquarium rather than the flowers and water critters going to the magnifier. This gap can be filled by a simple, intermediate-power cell phone magnifier constructed from a microscope lens, a piece of flooring, and a few rubber bands. The lens is a 4X, infinity-corrected Nikon 4X wide-field objective. The mount is a portion of 3/8″ high density fiberboard (HDF) flooring, desirable for its flatness, hardness, and ability to be worked with simple tools. 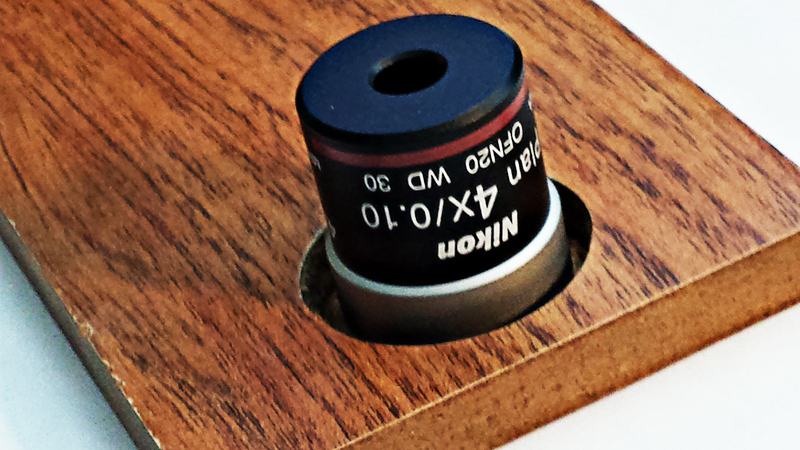 The field of view of a microscope objective lens is small, but this particular lens works well with the very small, high resolution sensor on the cell phone. On a drill press, the flooring, which is thicker than the length of the objective threads, is drilled approximately half way though with a 1″ wood bit to create a recessed hole for the objective. The remaining thickness of HDF should be equivalent to the length of the objective threads. The latter is then drilled the rest of the way using a bit just slightly smaller than the objective threads. This smaller opening can be carefully rasped and sanded out, maintaining the circular shape, until the objective can be threaded in with gentle pressure, Doing this with a fine circular rasp bit or small sanding drum on the drill press while the mounting plate is moved on the press table will maintain the vertical edges of the hole.The brass threads on the objective, being harder than the fiberboard, will create their own threads in the wall of the mounting hole. 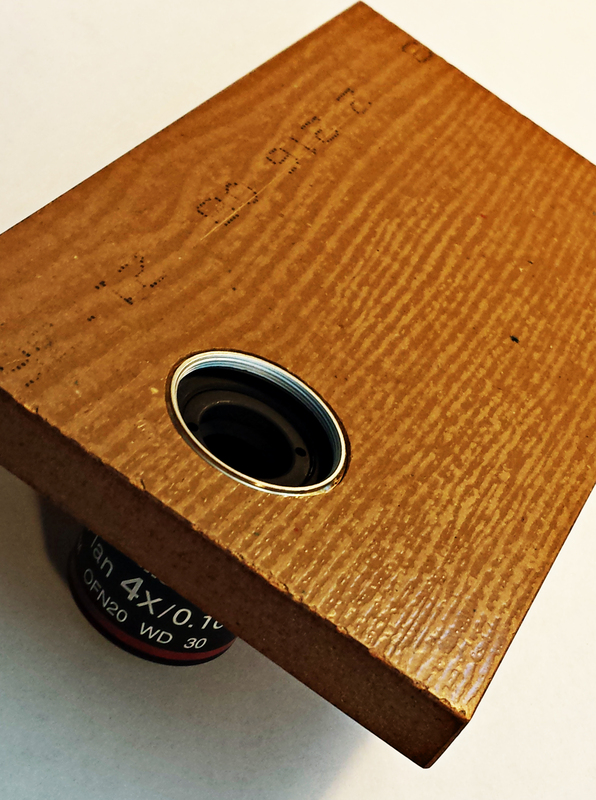 The base of the objective should end up flush with the back side of the mounting board. 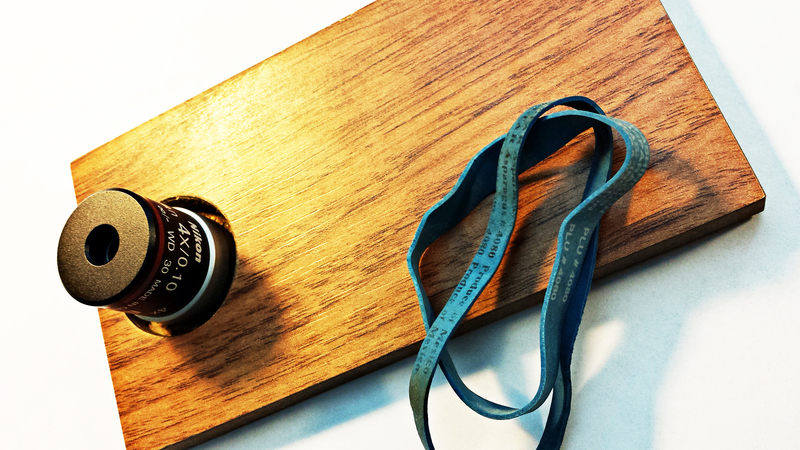 The whole piece is then given a rubbed, wax finish with Briwax or a similar one-step finishing wax. Since the magnifier is intended for use outdoors or around aquaria and ponds, this finish soaks into the porous edges and protects them from moisture. The phone is then held onto the back of the mounting plate with two broad, sturdy rubber bands; I use the ones that hold stalks of broccoli together in the supermarket. If you don’t like broccoli, steal a couple next time you are in the produce aisle. 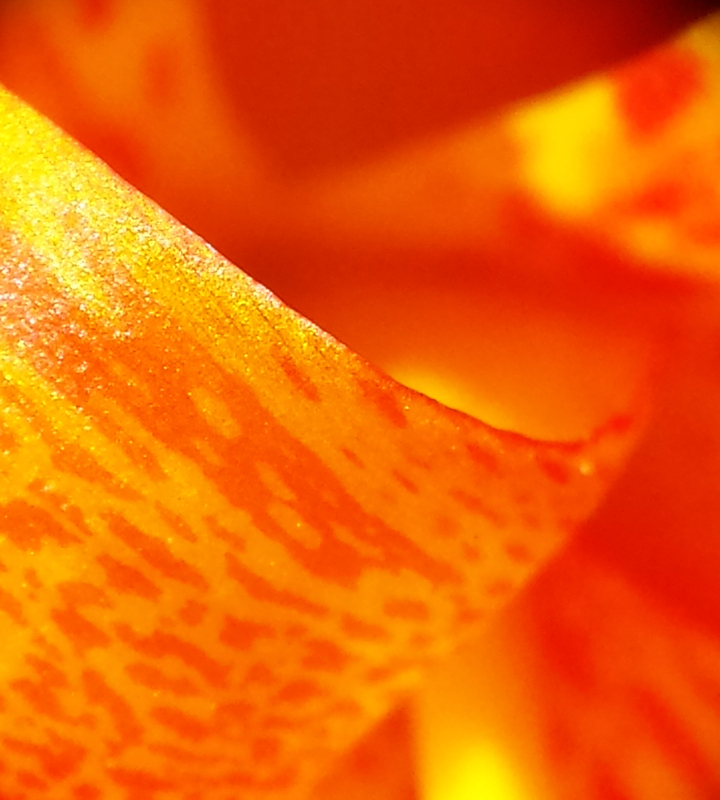 On the Samsung Galaxy 4, dial up the magnification to 4X. The image from the objective should almost fully fill the screen with a bit of vignetting at the edge. Focus by moving the whole assembly backwards and forwards through the optimum working distance of the objective, about 1.5 cm. 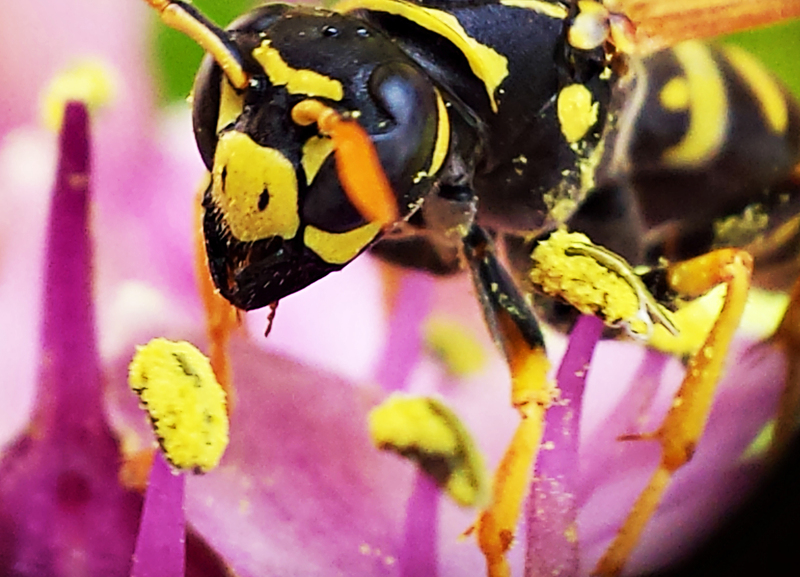 The autofocus on the phone will take care of fine focus, or this function may be turned off. If the phone tends to slip and lose its centering, glue a narrow (~3 mm) strip if thin rubber or leather on either side of the back of the mounting plate to help hold it in place. This method works well with the Nikon objective ($65 on eBay), which has a flat field and good resolution. There are probably many other objectives, such as the Zeiss Jenas, Tiyoda Planachromats, Polish PZO lenses and even older American Optical 4X infinity-corrected lenses, which may work and are available even more cheaply. For still images, the addition of a tripod bracket and focusing rail might also allow stacking of images for non-moving subjects if the autofocus function of the cell phone can be turned off. The possibilities are endless – put your phone and magnifier in your pocket, and go out and explore the world of the very small. You can do it in your garden, on a walk, in the produce or flower department at the supermarket, in an aquarium, or at your local nursery. Create! Somenos Lake and Marsh, located a short distance north of downtown Duncan, consist of seven-meter deep Somenos Lake, hollowed out when glaciers receded 11,000 years ago, and its surrounding marsh system. The system, 200 hectares in size, includes Somenos Lake and four creeks. Somenos Creek is the outflow from Somenos Lake into the Cowichan River, while the primary streams into the lake are Richards, Averill, & Bings creeks. Grass and shrub habitats are common, and willows are interspersed throughout. Adjoining farmlands become flooded marsh-like areas in winter and spring. Some of the rare flora and fauna found here include the Vancouver Island Ringlet, Prairie Lupine, Yellow Montane Violet, and Garry Oaks growing in deep soils. The marsh area is unique for its population of trumpeter swans, with up to 1,000 swans in winter, representing 5% of the world’s population. The combination of oxygen reduction at the bottom and temperature increases at the surface forces indigenous fish into the middle layer, where there is still some oxygen and temperatures are not too warm. In most recent summers, even that habitable middle layer has disappeared, resulting in fish kills. Accessible for collecting at the boat launching ramp and its tributary streams, Somenos Lake and its tributaries represent the most important source of pond samples in the Duncan area (adapted from IBA and Cowichan Watershed Board sites). 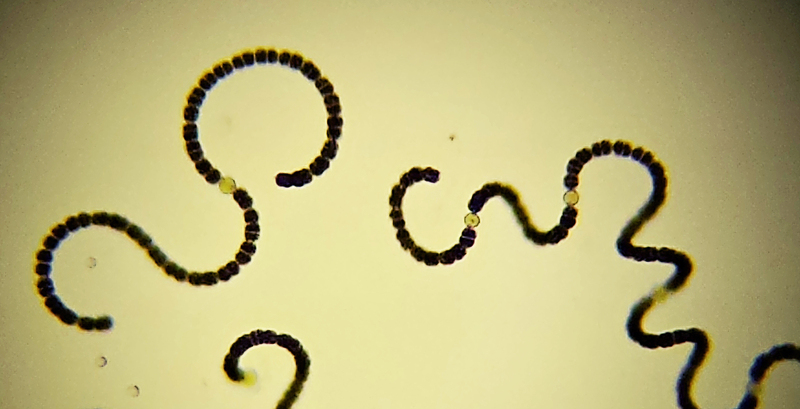 “Anabaena sp. can produce several kinds of toxins. Two different neurotoxins have been described. Anatoxin-a is a potent postsynaptic cholinergic nicotinic agonist, which causes a depolarizing neuromuscular blockade. Anatoxin-a(s), chemically unrelated to the first, acts as an inhibitor of cholinesterase leading to a neuromuscular blockade. Both cause a “tetanus- like” muscle paralysis. Neurotoxins are notoriously rapid-acting poisons. Onset of symptoms and death to the animal may occur within a few minutes to a few hours, depending upon size of animal and amount of toxic bloom consumed. Anatoxin-a toxicosis may exhibit staggering, paralysis, fasciculations (muscle twitching), gasping, convulsions, backward arching of neck in birds, and death. Anatoxin-a induced toxicosis in experimental animals may exhibit hypersalivation, tremors, fasciculations, involuntary muscle movement, diarrhea, cyanosis (tongue and mouth lining appear bluish). and death. 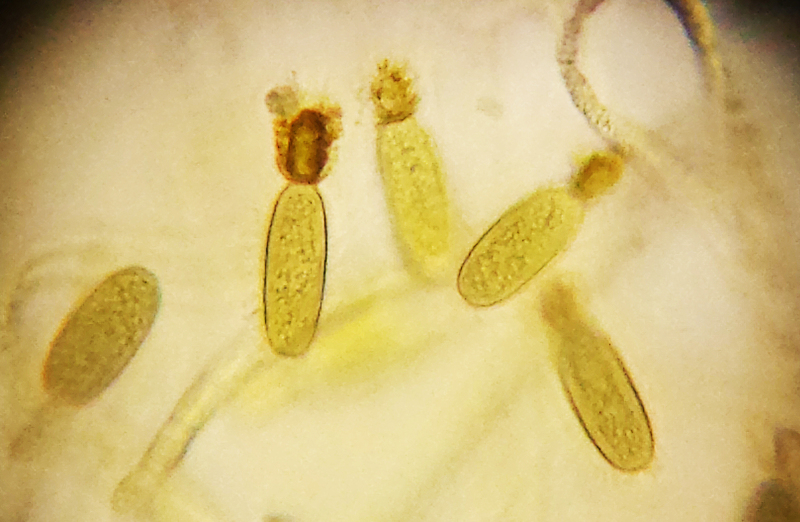 Members of this genus also produce Microcystins (hepatotoxins). Named for the genus in which they were originally discovered, they alter the cytoskeletal components of hepatocytes leading to intercellular dissociation causing blood accumulation within the liver and death by hypovolumic shock. Very recent experimental evidence shows that at least one of the molecular mechanisms of action is consistent with certain known carcinogens. Researchers suspect these toxins may also be possible liver carcinogens. This could prove significant to humans following continuous, low level exposure. Poisoning from microcystins may take 30 minutes to 24 hours to appear, depending upon the size of the animal affected and the amount of toxic bloom consumed. Microcystin toxicosis may exhibit jaundice, shock, abdominal pain/distention, weakness, nausea/vomiting, severe thirst, rapid/weak pulse, and death (see Crayton)”. 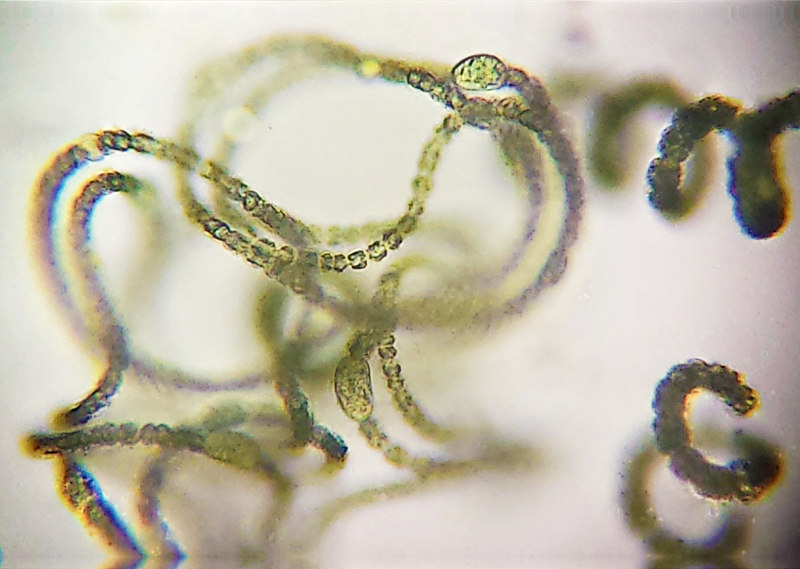 Despite its toxicity and sludgy appearance in the lake, Anabaena is actually a very pretty organism. Unlike eukaryotic cells with their mitochondria, nucleus, and endoplasmic reticulum, bacteria cannot form chemically-separate intracellular compartments to isolate chemically-incompatible functions. 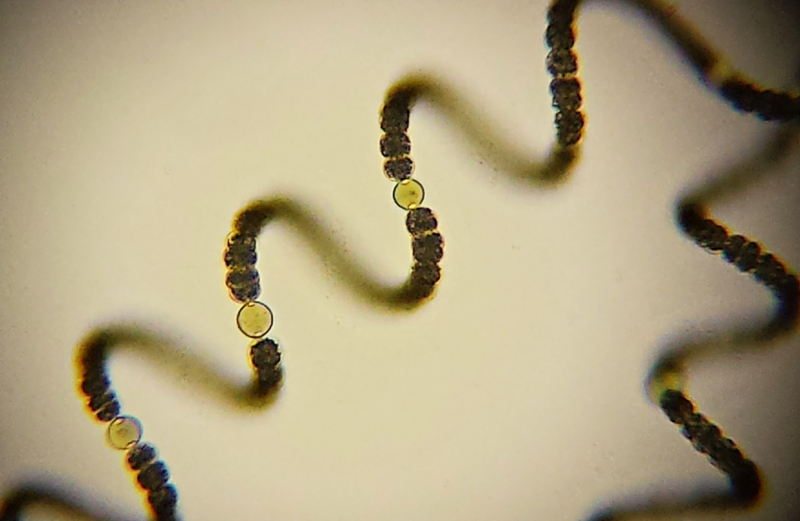 Cyanobacteria have developed interesting adaptations to solve this problem. 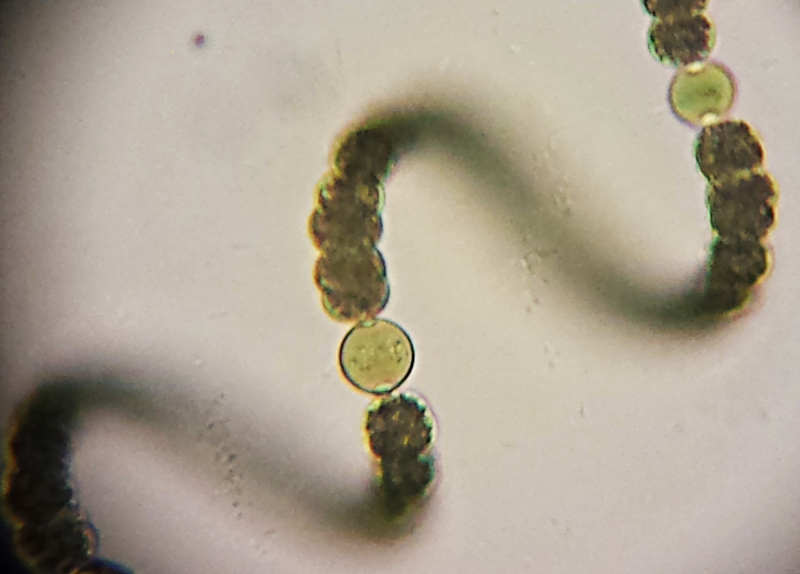 Heterocysts in Anabaena 600X. Note internal substructure in heterocyst. “…Due to the necessity of keeping nitrogenase isolated from oxygen, heterocysts have developed elements to maintain a low level of oxygen within the cell. To prevent the entrance of oxygen into the cell, the developing heterocyst builds three additional layers outside the cell wall, giving it its characteristic enlarged and rounded appearance, thus the rate of oxygen diffusion into heterocysts is 100 times lower than of vegetative cells. One layer creates an envelope polysaccharide layer where the nitrogen is fixed in a oxygen-restricted milieu. To lower the amount of oxygen within the cell, the presence of photosystem II is eliminated, and the rate of respiration is stepped up to use up excess oxygen… (MicrobeWiki)”. 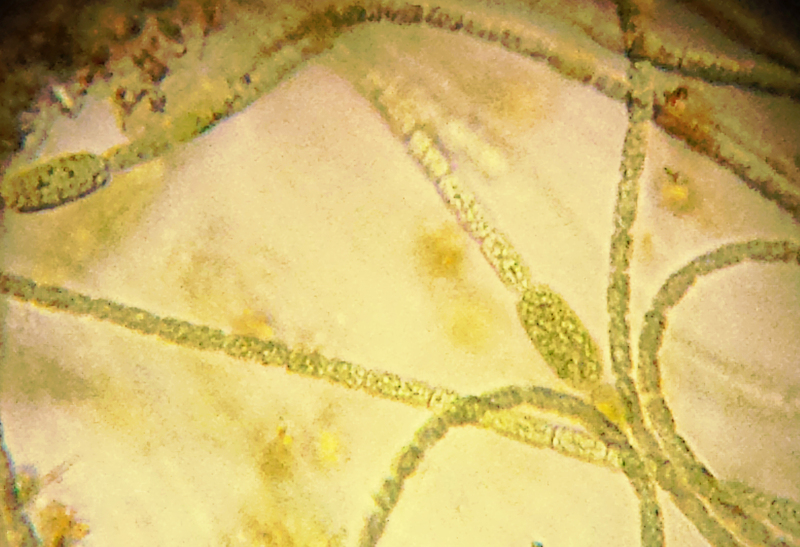 Like Anabaena, Microcystis is well known for producing neurotoxins (including cyanopeptolin) and the hepatotoxic cyclopeptides microcystins. 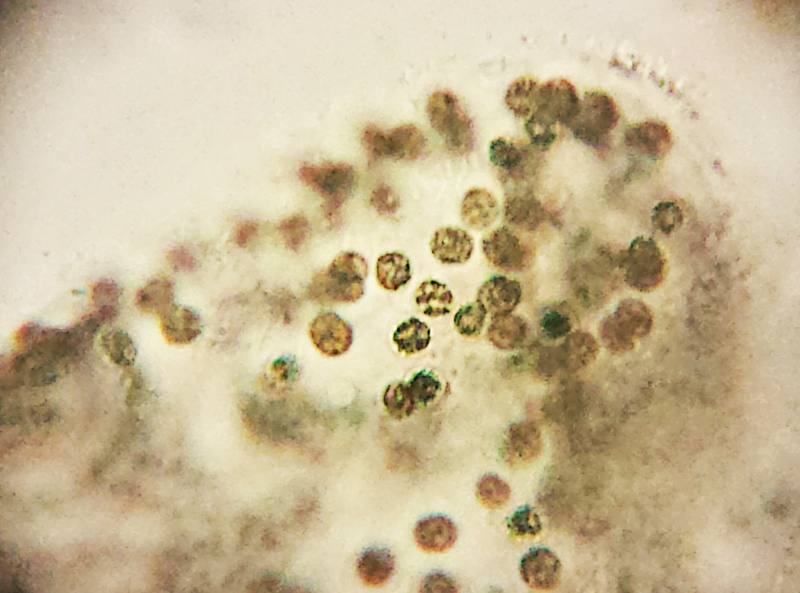 Intracytoplasmic gas vesicles allow Microcystis blooms to rise to the surface for optimal growing conditions, where they form surface accumulations and are a major nuisance in affected bodies of water. It has the unique ability to thrive in the presence of gylphosate (Monsanto’s Roundup), in fact using this herbicide as a nutrient. 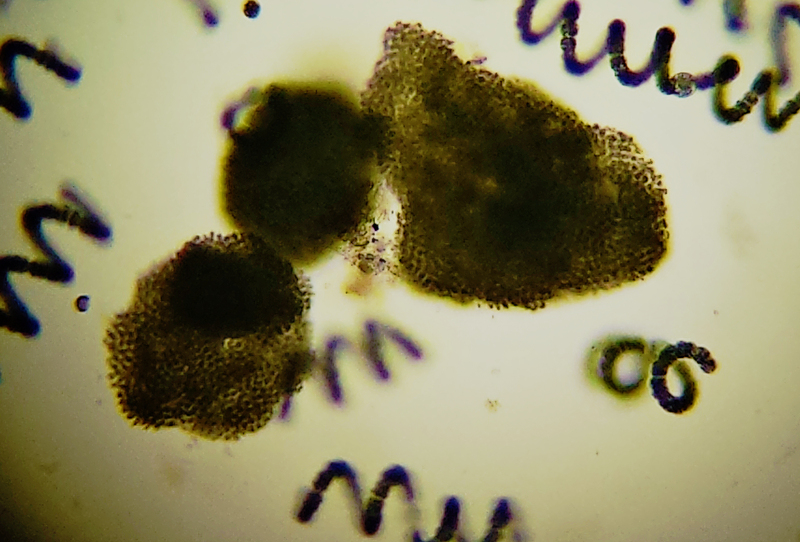 Multiple species of Microcystis have been described in the literature, but the cellular and colonial morphology of this genus of cyanobacterium is extremely variable – genetic classification seems more certain than any traditional morphological system, so speciation should be considered tentative at present (see Komarek). 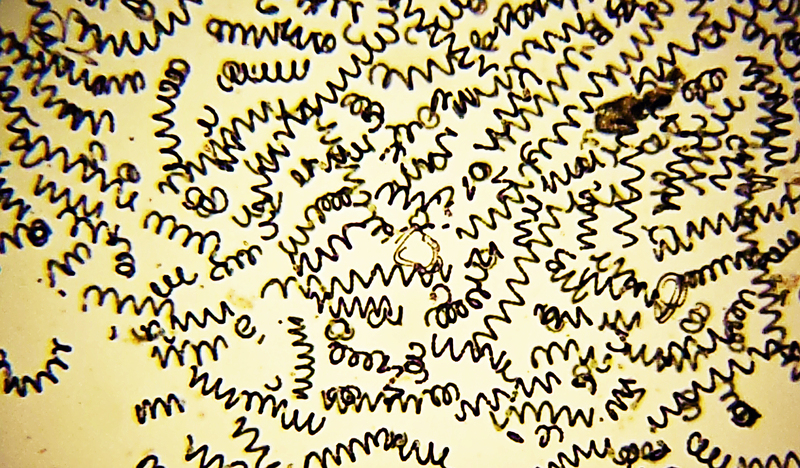 Furthermore, chemical typing of the toxins and other metabolic products of a wide variety of Microcystis reveals that there is little correlation between structure, colony appearance, and chemical characterization. Consequently, speciation of Microcystis by traditional morphological criteria is of debatable value (see Welker et al.). 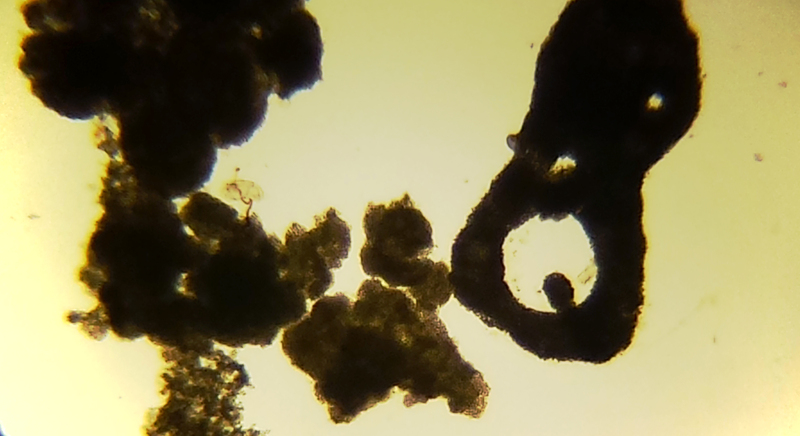 Nostoc, stack of two images. 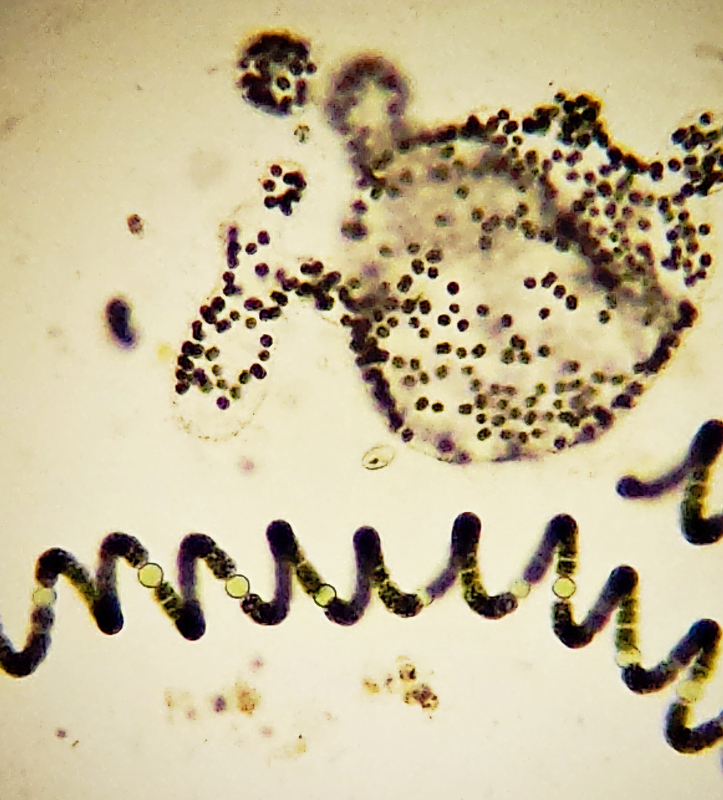 Note smaller cell size and thinner filaments compared to Anabaena on right. (Sanguinis: So what do you expect when you pour a bunch of fertilizer in my nice clean lake and let your cows poop in it and then screw up the weather? Gardenias and palm trees??? This was a nice neighborhood before your crowd came along). Sanguinis: Leeches, like cats and some humans, are cultured and DISCERNING creatures who require elegant and well-appointed accommodations. 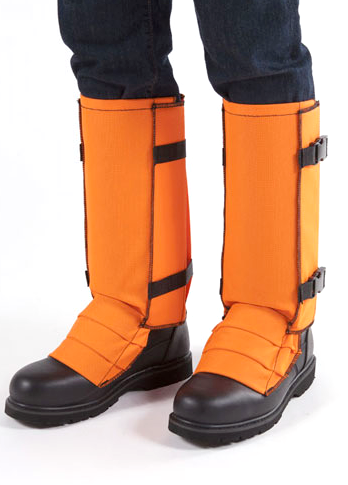 We do NOT do well in a muddy jar, forgotten behind your pile of last year’s Popular Mechanics! We need light, cool temperatures, and a well-ventilated home with at least a MODERATE degree of class, balance, and sophistication. Fortunately, providing a classic and comfortable home suitable for your watery family members can be done with minimal construction mess and expense. REALLY, with just a bit of ingenuity, you can create a home that even a sophisticated being such as MYSELF would be proud to inhabit! Clean aquarium thoroughly with soap and water, followed by a small amount of bleach water to sterilize. 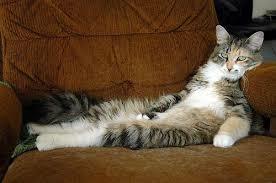 Rinse thoroughly and dry. Cut a base from smooth, high density fiberboard (HDF) or plywood, slightly larger than footprint of tank. Seal surface with wax finish (e.g., Briwax), varnish, or paint. Fill aquarium with about 2″ of mud, the gooier the better. This should contain a population of worms and other bottom-dwelling creatures that will emerge and create a community as the aquarium settles. Use flat rocks to wall off one back corner to within 3-4″ of intended water surface level, packing mud or lake soil behind rock for support and planting area. Deep-rooted plants may be incorporated in to this soil as the wall is built up. 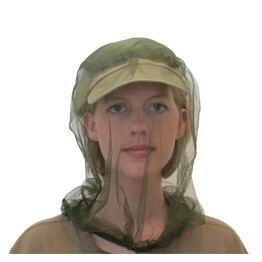 You will probably add to the plants as you explore neighboring ponds and marshes. Add other rocks as your artistic sense dictates. Gently fill aquarium to within 3″ of top with pond water. Add collected rooted and floating plants, waterlogged sticks, etc. The higher elevated area behind the rocks should be planted with shallow-water marginal plants, while deeper species go in the main part of the tank. Leave top uncovered for ventilation and to allow rushes, sedge, grasses, Equisetum, and tall species to grow up. 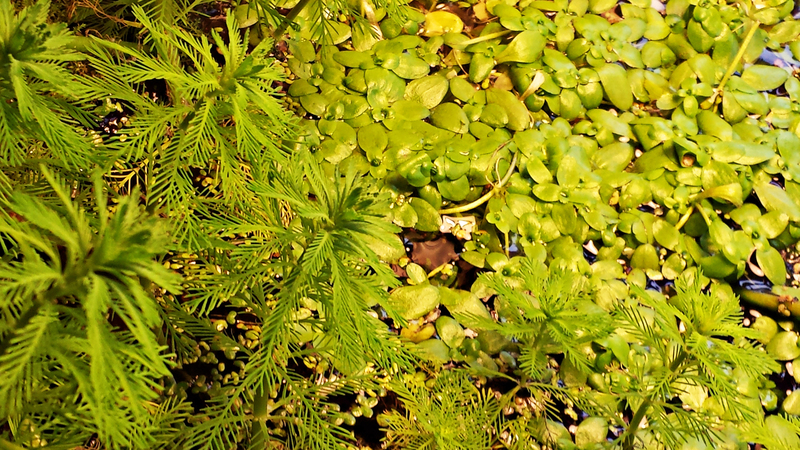 Include some duckweed and other surface plants – duckweed roots are mini-ecosystems by themselves, and are one of the best places to find organisms such as hydras, Vorticella, and Stentor. Mold can be a problem in this moist environment, and certain types of plants are particularly susceptible. 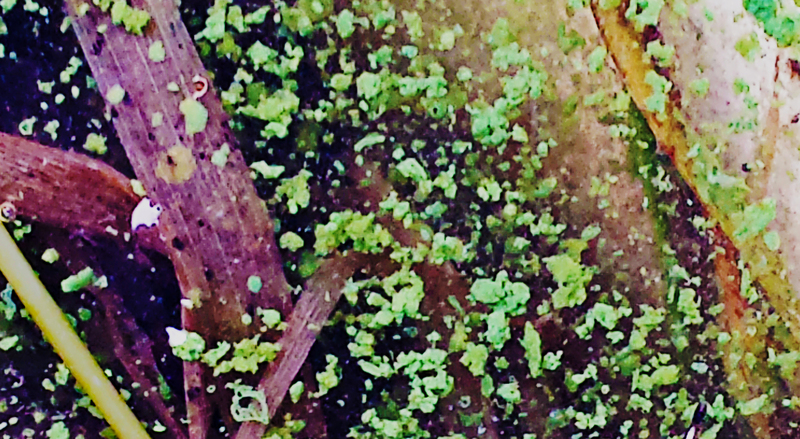 In the moist Northwest environment, partially covering the top of the tank with a glass sheet to slow evaporation, or using a hood and lamp, led to mold overgrowth on plants and exposed glass. This problem was minimized by leaving open the top of the tank open, letting reeds and grasses grow tall, using long-armed office lamp for lighting, and replacing evaporation with lake water. The aquarium will be a muddy mess for 24 hours, but will gradually clear and settle. Watch carefully over the next two weeks as the population of water creatures crawls out and establishes itself. Algae will grow, snails will wander the glass and plant stems, and careful watching will be rewarded by glimpses of of hydras, oligochaete worms clad in fragments of duckweed leaves and wood, shrimp, and planarian worms. Leaving the light on 10 hours/day will pump energy into the system, and such tanks can be active and self-sustaining for months without cleaning or aeration. Having plenty of plants seems to be key to sustainability and balance – bodies of water with no plants steadily develop overgrowth of algae, while those with copious plant material stay clean, healthy and clear. Note – I use my small aquarium as a final repository for all interesting specimens, with at least a small aliquot being added. This builds up the diversity of the tank. The ideal vessel for pond water studies is the thrift shop “mini-aquarium.” Start prowling the glassware aisle your local GoodWill stores. Among the tall, ugly old vases, look for the occasional roughly cubical or cylindrical glass container 6-10″ across and roughly as deep. The low profile permits planting, trimming, and sample extraction, and provided a good surface to volume ratio for gas exchange. Try to get one with reasonably smooth glass for optimum photography. These are actually superior to traditional aquaria – the all-glass construction is sturdy, they can be picked up and moved without breaking when full, they can be readily washed out in the sink between uses, and the size is just right for a couple of yogurt containers worth of mud, water and plants. The same principles apply – lots of plants, ideally some mud at the bottom, and a little $5 thrift shop desk lamp for light 10-14 hours a day. Don’t feed (see below) for a couple of weeks until everything get established, then top up with hay infusion. These are ideal single-source specimens; if you have three or four containers, label each one with the source, and observe the differences in flora and fauna at each site, as well as the population differences as the seasons progress. Cleaning the inevitable accumulation of algae from the less even glass is a bit harder, but can be done with a slender razor blade scraper made from a steel-backed razor blade and a thin piece of steel rod. When the specimen is returned to its source and the little tank is cleaned, stubbornly-adhering algae can be removed with toothpaste or a fine scouring power like Bon Ami (Canada) or Barkeeper’s Friend (USA). Stay away from plastic containers – hydras and other creatures cannot attach to this surface to be observed, and scrubbing off persistent algae inevitably scratches the plastic. 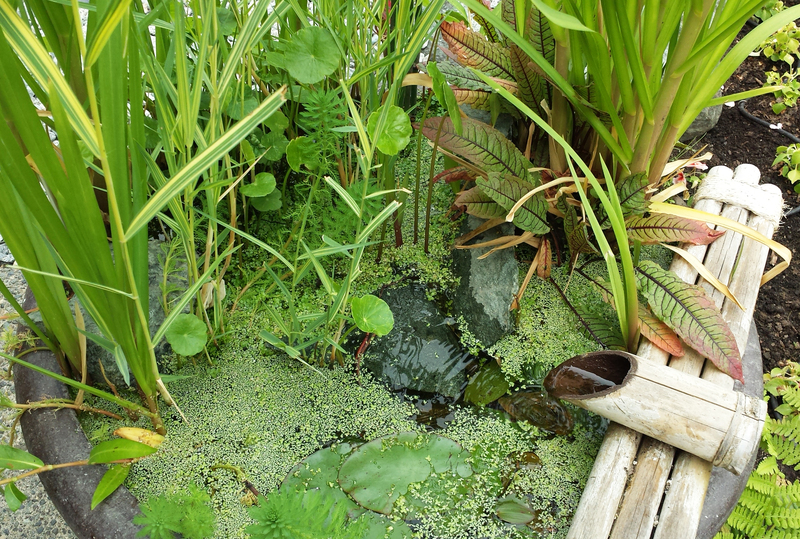 The same principles can be used to build small and attractive outdoor ponds in large pots or planters, and these can be an alternative to an indoor aquarium. The planter is cleaned, and rocks or a bamboo meshwork is built to wall off about half of the planter’s volume. This area is filled up to just below the intended water level with marsh mud and plants, then the planter is topped up with lake or creek water. A small decorative pump and water feature can be added, but with sufficient numbers of plants in the system, water stays clear and fresh without circulation or filtration. A small amount of pond plant fertilizer can be added if needed, and evaporation is replaced by fresh lake water (I can be found at odd hours filling bottles at local ponds and boat ramps). 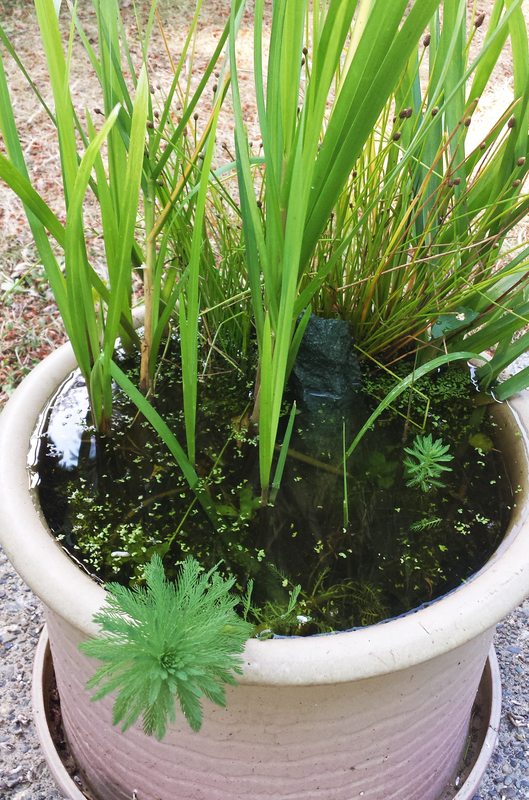 Small outdoor ponds in pots can have other benefits; one made in an unused ceramic planter became a haven for small birds during a summer drought. They perched on the rounded edge, dined on surface insects and unwary water creatures, and ate most of the duckweed, which is extremely nutritious. When the tank first stabilized, it displayed a moderate population of small copepods. 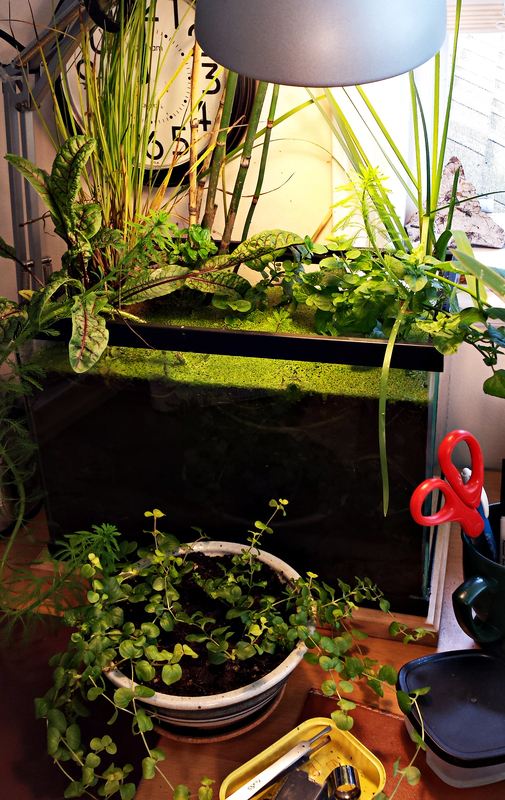 Over the next two months, the plants grew, the water cleared, and this small ecosystem stabilized and flourished. However, the population of copepods and protozoa slowly dwindled, and it became apparent that a way to nourish the system over and above the light was needed. 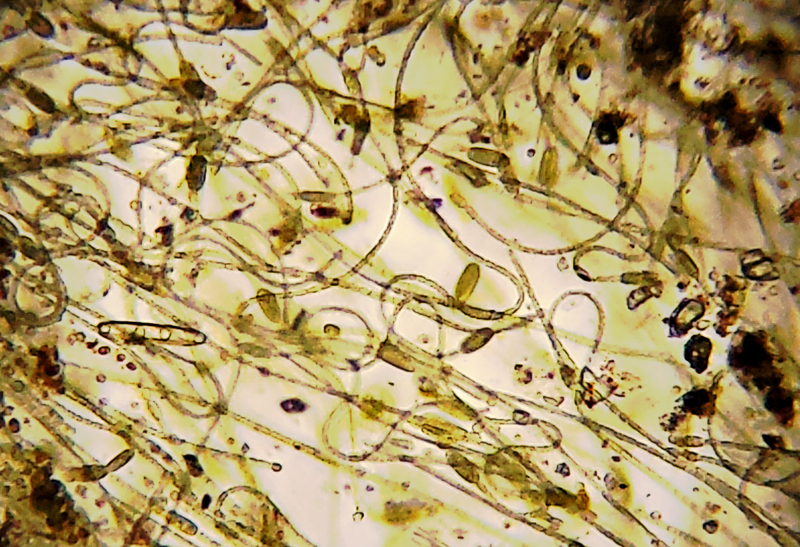 Research on nourishing protozoan cultures suggested a hay infusion as the traditional and time-tested method for feeding protozoa, although other grains can be used (http://www.microscope-microscope.org/applications/pond-critters/culturing-protozoa.htm). A friend with horses donated a bag of hay. Two handfuls were placed in a gallon of lake water, the mixture was brought to a boil and simmered for 10 minutes, then allowed to cool. The infusion was decanted into a clean plastic bottle, stored in the refrigerator, and used to top up the aquarium as needed. 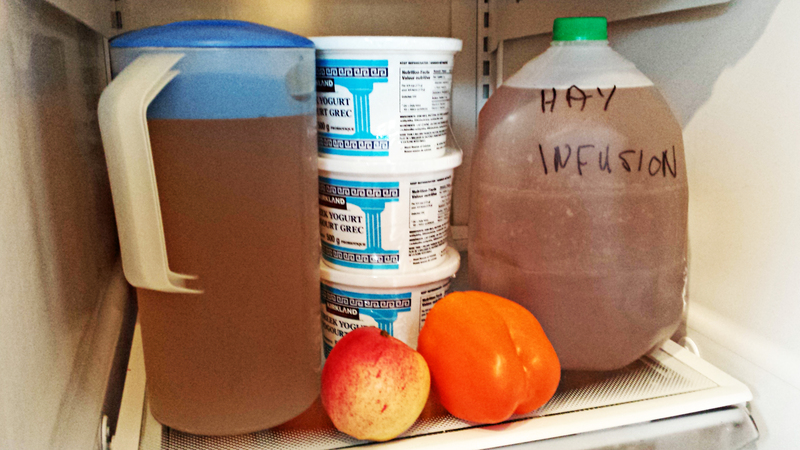 The infusion smelled of fresh hay at first, but after a couple of weeks, even under refrigeration, began to sour. Aliquots were therefore frozen and thawed as needed. The effects of adding these nutrients seemed to progress from the bottom of the food chain upwards. 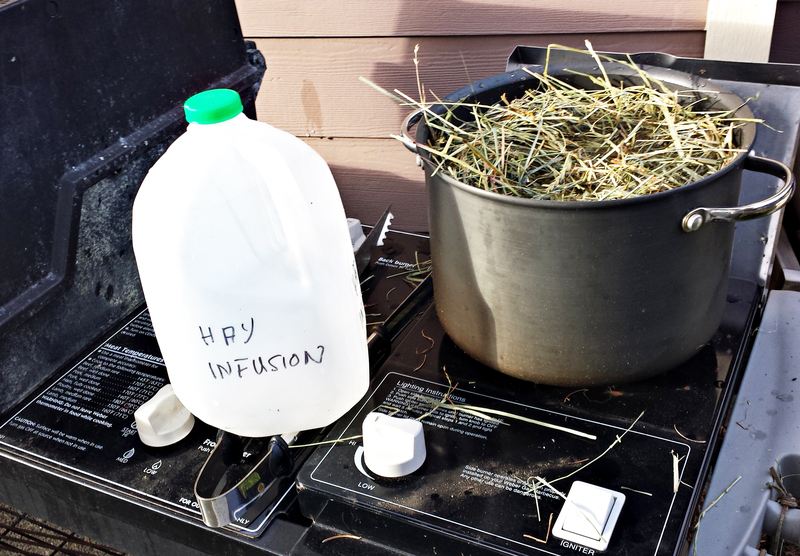 Two days after adding hay infusion, the water clouded and the bacterial count rose. 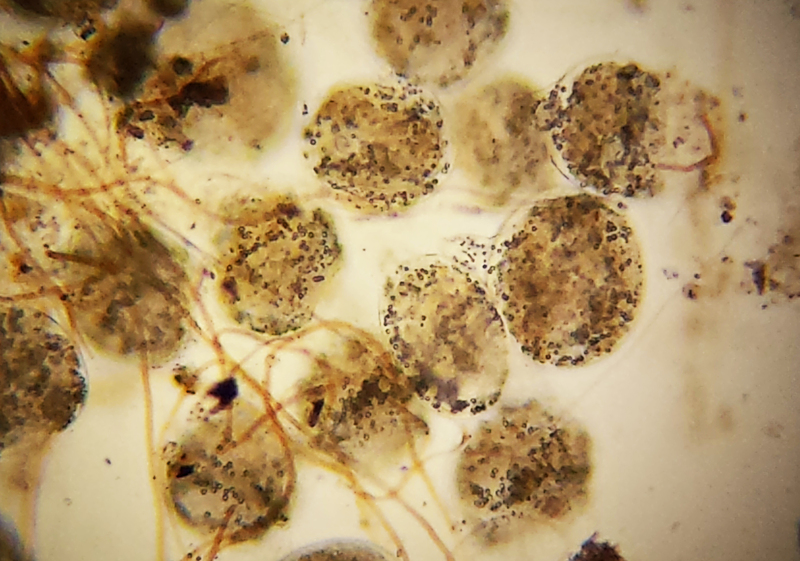 Over the next few days, the water cleared as the bacterial count dropped, and the number of copepods visibly increased, presumably corresponding to the number of edible protozoan plankton. 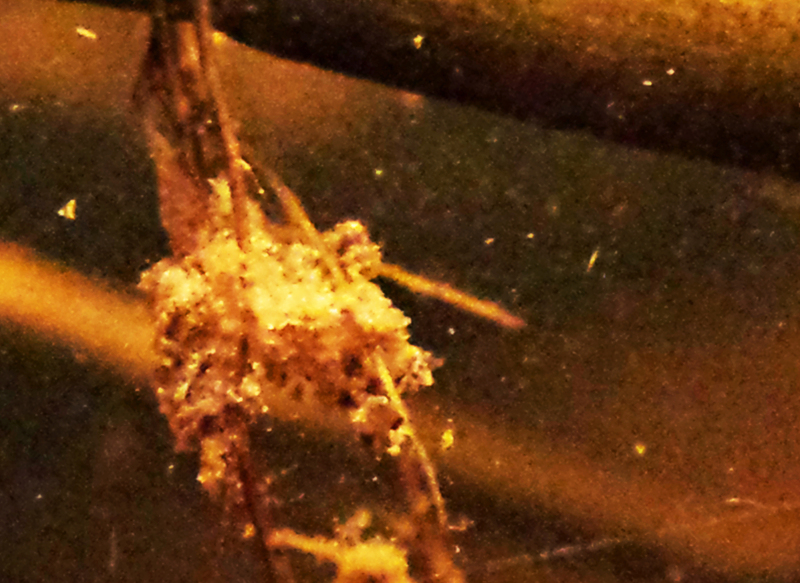 Repeated use of the infusion during the winter kept up the population of copepods and secondary predators such as hydras; the latter proliferated and could be found in significant numbers in favorite, well-lighted areas on the glass. Note also that the infusion should be plainly labelled in the refrigerator. 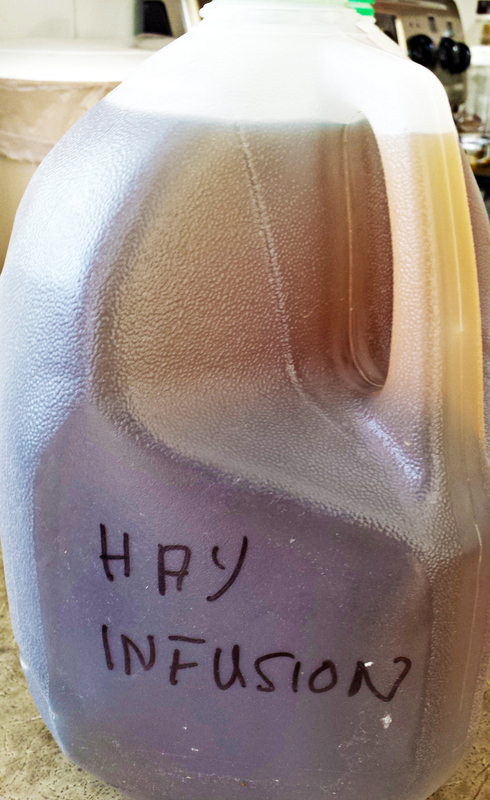 My wife spent part of a week enjoying my unlabelled hay infusion while I was out of town under the impression that it was herb tea. It is actually sterile, quite tasty, and probably as nutritious as any vegetable broth. However, your family will probably be happier if they do not have to second-guess which bottles are consumables and which are culture medium in the refrigerator. We went on a week’s trip, leaving a happy tank filled with hydras, worms, and snails. We returned to find a dying, smelly tank with moribund plants. The tank had been topped up with hay infusion, then all the windows were closed and the weather turned hot. Temperatures in the house probably rose to 100 degrees F. The tank had an oily surface film reflecting lipids from decomposing plant and animal material; this was teeming with bacteria and Paramecia. It is likely that heat (unlike a lake, pond, or marsh, a small aquarium lacks the cooling reservoir of ground or water, and is very susceptible to overheating), together with overfeeding and bacterial overgrowth (leading to bacteria consuming oxygen) in the warm temperatures produced a killing combination. Solution: The aquarium is situated near a window which is closed only during cold temperatures. A small fan situated on the windowsill blows outside air continually past the tank. During winter, when our house is kept cold (64-66 degrees F), evaporation is mild, and fresh hay infusion made with boiled lake water can be used to top up the tank, serving the dual purpose of nutrition and evaporation replacement. In summer when the house, which does not have air conditioning, becomes warm, evaporation is much greater and is replaced with fresh lake or creek water supplemented with lesser amounts of hay infusion. The best balance of infusion and lake water is still unclear. Like any garden, one has to deal with pests. Having plants grow indoors in the moist environment above an aquarium’s surface is a challenge. Such plants are exposed to a variety of airborne garden and household infestations that are not as much of a problem with purely aquatic plants, or outdoors plants with freer access to breezes and sunlight. All houses in the damp Pacific Northwest deal with window condensation to some extent, and black windowsill mold requires regular cleaning. This mold was a problem with the first tank after it was initially covered, and never quite went away. It decimated a lovely planting of watercress. After the collapse of the first aquarium, the second one was left open from the start and never developed this problem. 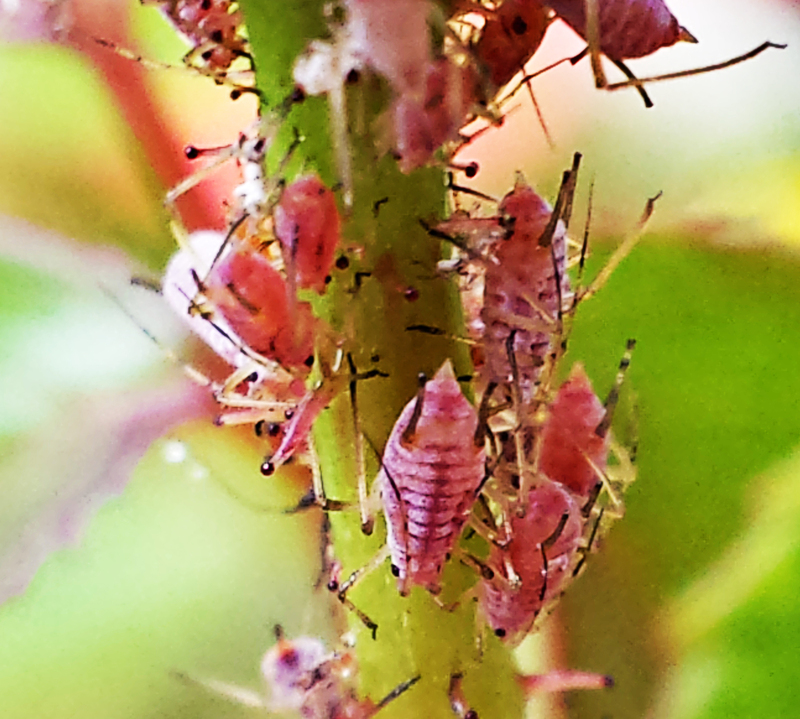 The main problem with the surface plants of both aquaria was aphids; these moved in from the outside garden after about two months and drained the juices from the leaves and stems of the broad-leaved plants, leaving the tougher Equisetum and grasses alone. Since one cannot spray over the surface of the water, they were reasonably successfully managed by brushing them off every few days with a soft-bristled makeup brush. Even though the aquarium is by a window, getting enough light for some of the plants, especially the grasses, is a challenge. The office lamp is left on 12 hours a day; with a fluorescent or LED bulb, heat is not a problem, and energy consumption is low. Still, some of the plants grow longer stems in response to light levels that are lower than outside sunlight. 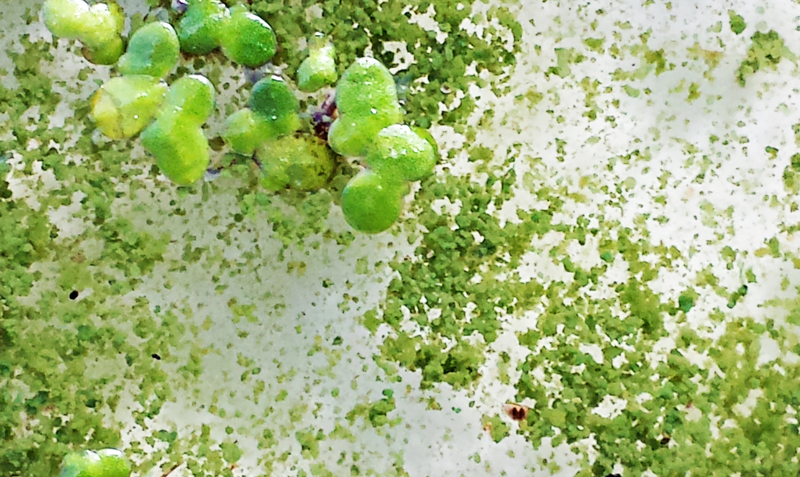 Pond life is endlessly fascinating – not only because we may discover an unknown species in our bird bath, but also because of the endless, very basic questions about the structure of life that climb up from beneath our lenses. 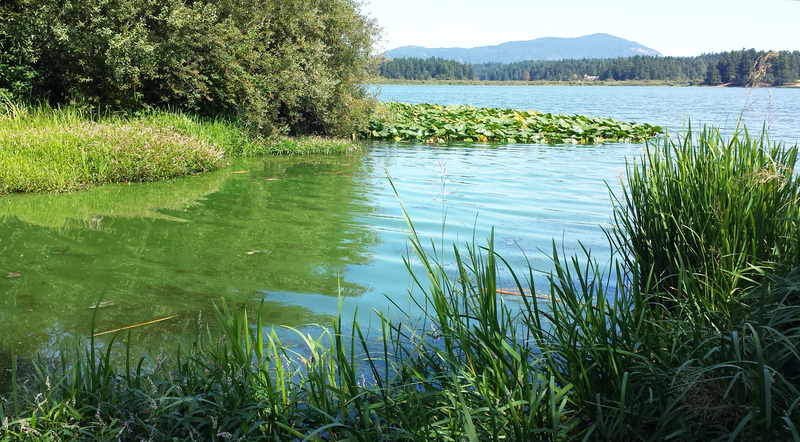 Two years ago, smelly green sludge took over our local lake. 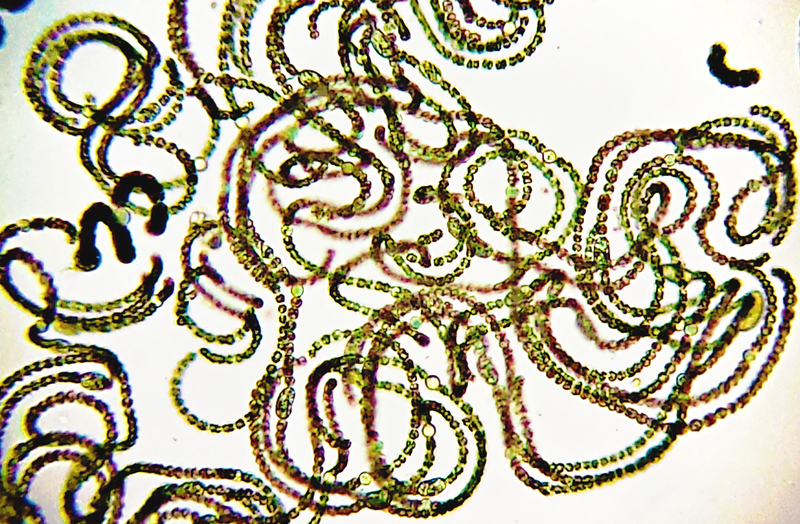 It turned out to be largely the beautiful helical photosynthetic bacterium Anabaena. Like pearls on a necklace, Anabena shows round heterocysts where nitrogen is fixed – a process that is chemically incompatible with the photosynthetic processes taking place in the rest of the chain. Bacteria don’t have internal organelles to isolate chemical processes that don’t get along with each other, so they have to get inventive, and add on another cell in the chain – the bacterial equivalent of building a spare room on the house. We know that the photosynthetic vegetative cells of the chain provide the heterocysts with sugars, and the heterocysts provide the rest of the chain with reduced nitrogen in the form of amino acids. But how does Anabaena get the groceries back and forth along the chain??? Many of our favorite critters are single-celled, and perform their amazing functions entirely with one cell. However, in every being of more than two cells, those cells need both a way to stick together and a rapid and efficient way to talk to each other. This function is critical for cells ranging from primitive cyanobacteria transferring nutrients, to human cardiac muscle cells coordinating a wave of contraction to keep the other millions of cells alive in a complex body. These essential functions are performed by the many different kinds of cell junctions, the subject of intensive research for many decades. Some serve a strictly structural function, while others are essential for cell-cell communication. Visible at the level of light microscopy only with specialized labeling techniques, their many complex patterns are fascinating under the electron microscope. 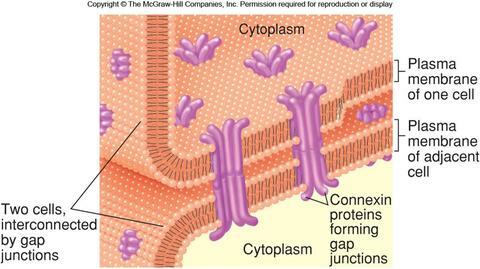 Tight Junction Between Epithelial Cells. Junction provides seal between lumen and tissue extracellular fluid (ECF) compartment (from Kimball). Animal cells have four different types of intercellular junctions: tight junctions, adherens junctions, desmosomes, and gap junctions. The first three are largely structural: tight junctions form tight seals around epithelial cells, preventing leakage and differentiating the functions of the apical and basal portions of the membrane; adherens junctions provide strong mechanical attachment between adjacent cells and anchor intracytoplasmic actin filaments (in cardiac muscle, for example); desmosomes are localized patches that hold cells tightly together and anchor intracytoplasmic keratin intermediate filaments (see Kimball). A fifth type of junction, the septate junction, occurs primarily in invertebrate cells, though it also occurs in certain vertebrate neurons. By electron microscopy, it appears as pleated sheets separating islands of cell membrane. Its function seems to be similar to that of the tight junction. The most fascinating are the gap junctions, highly structured and functionally complex intercellular channels permitting rapid movement of ions and small molecules between cells; their role in cellular communication is still perplexing, but has become a prominent question as a result of recent research. We all know how information travels through our bodies via our marvelous network of nerves and synapses, and how our metabolism is regulated by hormones dissolved in our blood – but there is third, more subtle and barely-recognized, communications system directly between cells via these tiny intercellular pores. 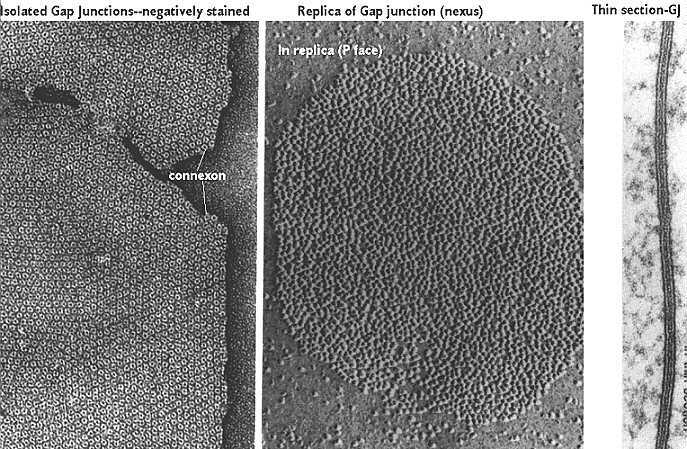 Six membrane-spanning connexin proteins surrounding a small channel, the hexagonal structure visible in high-resolution electron micrographs, form each unit of the gap junction. These are then arranged into arrays of varying sizes and shapes, often involving hundreds of individual junctional structures. Transfer of small metabolites between cells is possible through the channels. Gap junctions appear to play an unexpectedly important and widespread role in cellular coordination, and are present in every solid tissue in the human body. They coordinate the contraction of cardiac muscle cells and play some role in rapid transmission within the nervous system. They are seen in a wide variety of other tissues, such as pancreatic islet cells, granulosa cells of the ovarian follicle, and hepatocytes. In the latter case, only select liver cells react to glucose levels through direct innervation – neighboring cells are coordinated via gap junction signals. Gap junctions also play a role in cell-cell communication in embryonic development. They appear in both vertebrate and invertebrate cells, though the structural proteins are different – innexin replaces connexin in hydras and anenomes, and pannexins are present in higher invertebrates. Certain genetic diseases, such as the peripheral demyelinating disorder Chacot-Marie-Tooth syndrome, appear to result from defective connexins. For an excellent review of gap junction function and dynamics, see Goodenough and Paul. 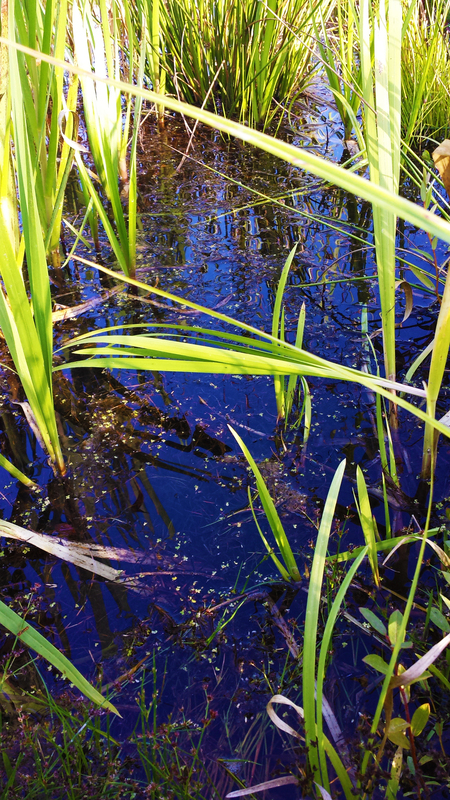 So what do cell junctions have to do with pond life? A lot, it turns out, though the full picture is just starting to emerge – see the review by Bereiter-Hahn et al. Every invertebrate and multicellular animal with more than a few cells, uses a variety of intercellular junctions to move, digest food, and hold together. Every time you look through the microscope at even a tiny multi-celled creature, you are watching cell junctions in action. In many if not most species, these junctions have not been studied, hence the lack of awareness of junction function and prevalence among fresh-water enthusiasts. For example, a Google search for “Cell Junctions” and “Nematodes” or “Rotifers” (or most other aquatic critters) brings up little that is informative. A few simple animals, plants, and primitive bacteria have become standard “laboratory rats” and have been the subject of intense scrutiny for years. For example, hydras, the focus of much research, use all of the above junctional types between their surface epitheliomuscular cells (see Chapman). Impulses among the cells of the nerve net of the stalk are coordinated through gap junctions, and blocking these junctions prevents hydras from contracting (see Takaku). Planarian worm regeneration, the subject of intense research since the early 20th century, depends on gap junction communication as one of the main mechanisms coordinating cell organization (see Lobo). 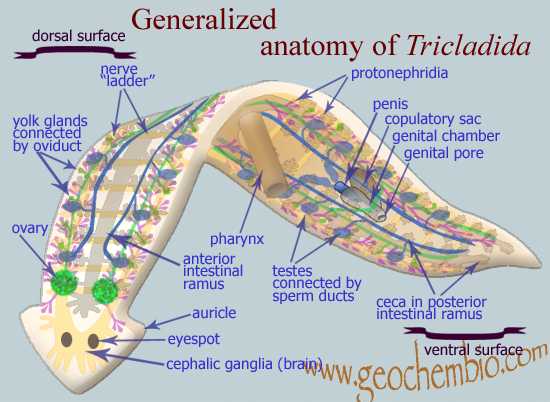 These junctions are found in all groups above the coelenterates and, though their role is still poorly understood, are probably essential in coordinating a wide variety of cellular functions, including movement, growth, and cell differentiation. Because of their thick polysaccharide cell wall, forming intercellular junctions is more of a challenge for plants and algae. Plant and algal cells have only one type of intercellular junction: the plasmodesmata. This structure, though it may fulfill some of the same functions as the animal cell junction, is more complex and quite different in origin. 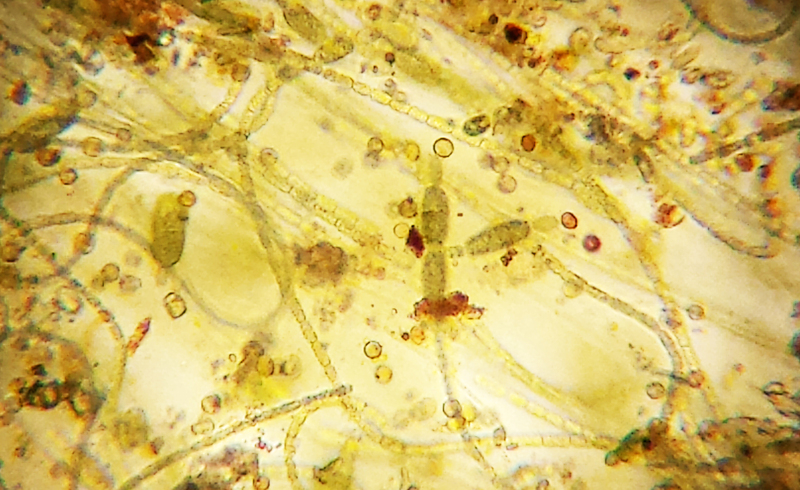 Plasmodesmata are found in land plants and some species of multicellular algae, including seaweeds. Neighboring plant cells actually appear to have one continuous cell membrane, with cytoplasm connecting through these pores in the cell wall. Within this membrane-lined pore passes a second membranous cylindrical sleeve formed from an extension of the cell’s endoplasmic reticulum. Contractile filaments appear to be present within the plasmodesmata and may faciltate active transport in addition to passive diffusion. The significance of plasodesmata is only beginning to be understood. Recent thinking suggests that land plants should be thought of as supracellular organisms because of the continuity of their cytoplasm and cell membranes throughout the whole plant. Interestingly, it is thought that some simple colonial organisms get along fine without formal cell junctions. Volvox colonies begin life as an “embryo” with all of the flagella pointing inward; the colony must turn itself inside-out as it matures, a task that it accomplishes with cellular shape changes and robust intercellular cytoplasmic connections (see Hohn). Rather than cell junctions, much of cellular adhesion in these multicellular green algae depends on the complex fibrillar and polysaccharide matrix of the cell wall. However, it is not entirely clear whether the apparent lack of intercellular communication via junctions in these simple multicellular colonial organisms is real or is due to the fact that we have not yet found them. It is thought that cell junction development reflects increasing evolutionary sophistication with increasingly complex multicellularity (Abedin and King). 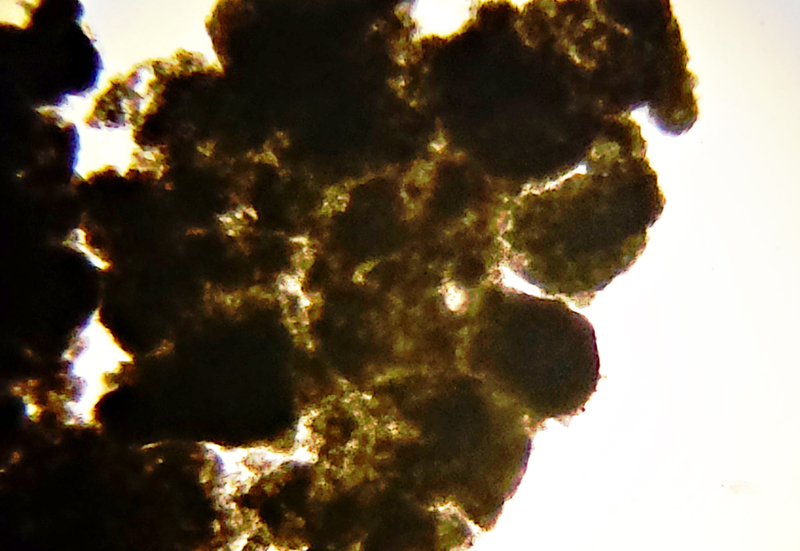 Sponges appear to possess rudimentary adherens junctions, and possibly septate junctions. Gap junctions based on pannexins as structural molecules appeared with the cnidarians (sea anemones and hydras). Connexin-based gap junctions appeared alongside the development of backbones with the chordates. Interesting, vertebrates appear to have also retained the more primitive pannexin-based gap junction type, and both are used in some tissues. The last type of cell junction to appear was the desmosome, which is seen only in vertebrates and supports epithelial tissues against stress. 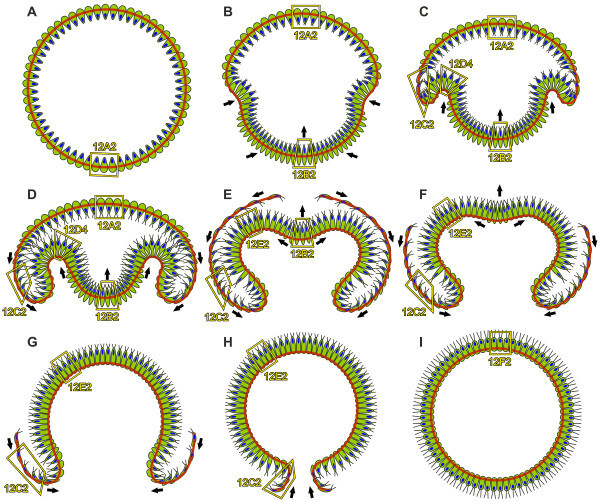 Later came hemidesmosomes, half-desmosomal structures connecting the bases of epithelial cells to the fibrillar basement membrane that underlies every epithelium. Transmission electron micrograph pf “septosome” junction between cells of Anabaena (Courtesy Wilk et al.). Although the component proteins of these junctions have been isolated, the structure of septal junctions is still only beginning to be understood. Early electron microscopic studies showed groups of structures, designated “microplasmodesmata”, traversing the peptidogylcan layer between vegetative cells and heterocysts. Recently, complex techniques such as electron tomography have being used to evaluate these structures (see Wilk et al), and the “septal junctions” or “septosomes” found by these advanced methods have proven to be identical to the microplasmodesmata. The most recent research suggests that the septosomes are 5.5-14nm in diameter, and pass through the intercellular peptidogycan layer via “nanopores” 20 nm in diameter. Present knowledge of septal junctions has been comprehensively reviewed by Herrero et al. 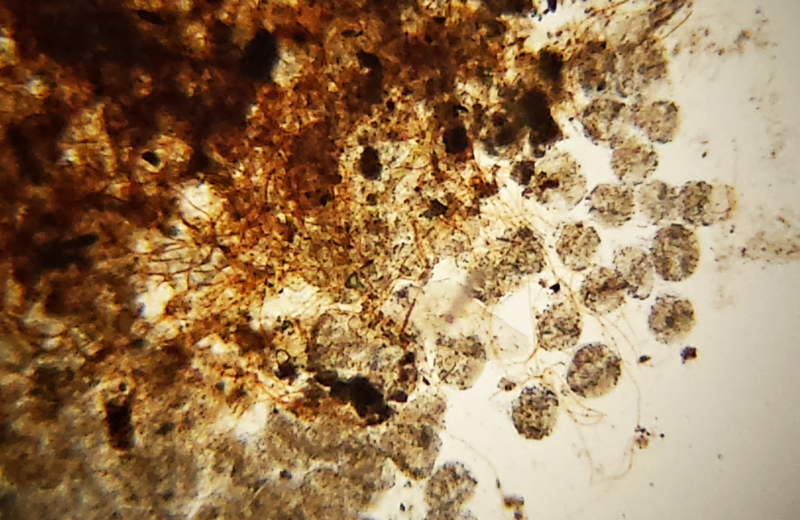 So the next time you look through your microscope at a little multicellular creature, wonder at the complex conversation that is going on between its parts. You share a kinship with that tiny creature – for it to move, or for your heart to continue beating, or for your nerves to speak to each other, both of you have cells that talk to each other instantaneously in ways that we are only beginning to understand! A small desk aquarium, besides being home to egotistical and self-important critters, is an endless source of wonder and learning. Since we cannot breathe water, we tend to see ponds and lakes from the top down – in other words, not very deeply. 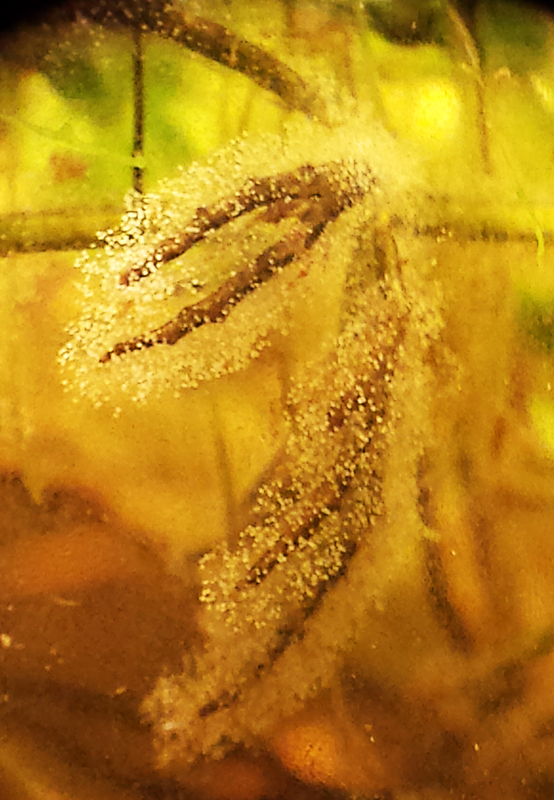 Even a small aquarium like mine gives amazing insights into the vertical life of a pond, from the insects on the surface to graceful worms on the bottom. 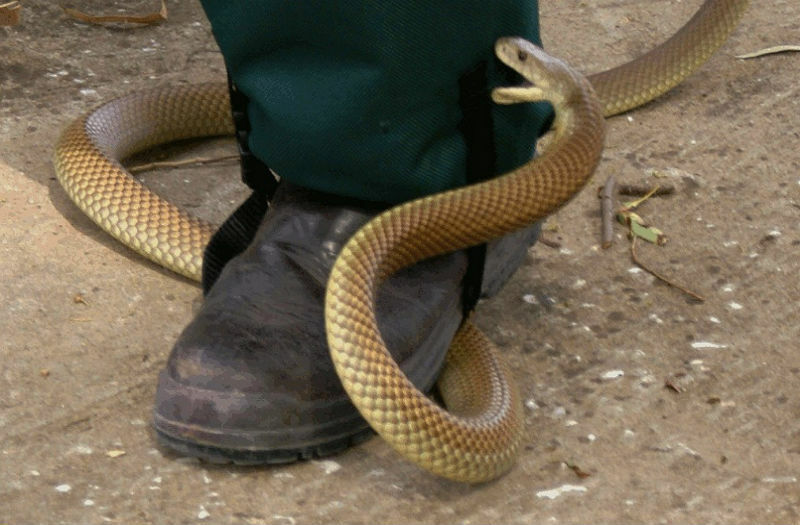 The worm shown here is a large adult, almost 2cm in length when fully extended. Multiple references are available on the anatomy, function,and genetics of this enormously well-studied worm. These colonies are mobile and can form and dissociate reasonably quickly. After keeping the aquarium on restricted rations during the summer heat, added ~800 ml of fresh hay infusion; within 24 hours, the water became mildly cloudy, as the bacterial count rose to feed the copepods, which had become scant over the summer. Enriching the water seemed to disperse the colony – so is colony formation related to food supply? This is one of the questions that make protozoology and fresh water biology so fascinating. 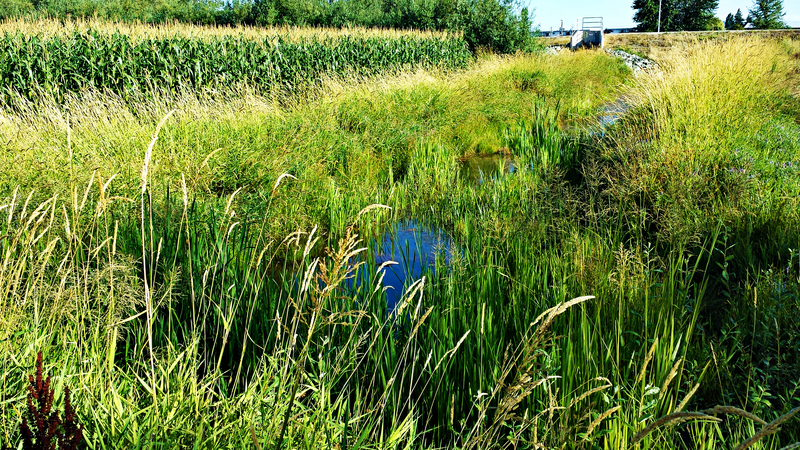 This ditch, at the periphery of Somenos marsh, is part of the new dike-and-drainage system completed about two years ago for flood control. Running parallel to a cornfield, it connects with the larger drainage system for lake overflow. For a new system, it has quickly developed a flourishing system of water plants and algae that is somewhat different from that seen in the boat ramp on the lake proper a kilometer away. 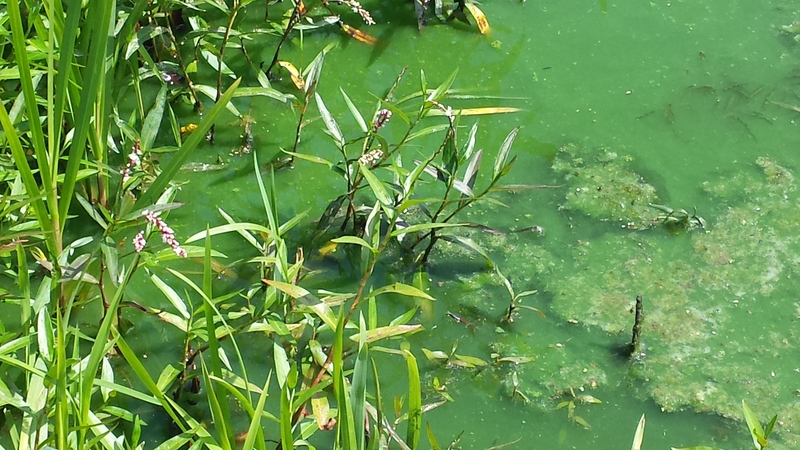 Areas of brownish and greenish algae dot the edge, and modest numbers of duckweed are present, but the water otherwise appears clear without the Anabaena bloom that affected much of the rest of the lake in the summer of 2015. 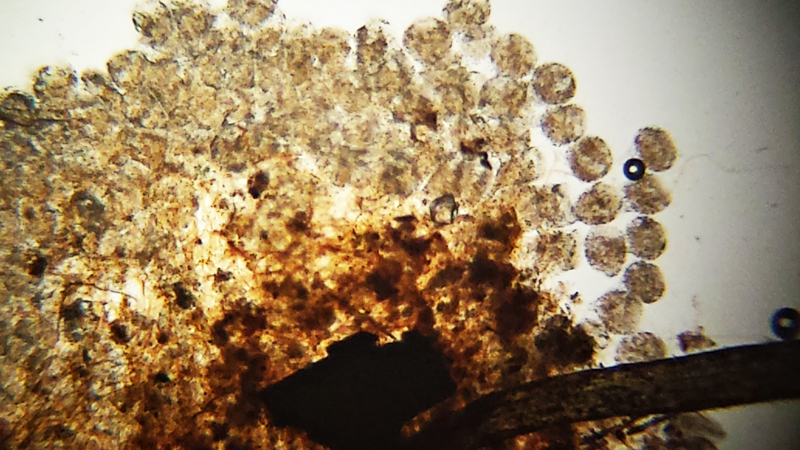 The ovoid structures are akinetes, or dormant cells; these thick-walled structures with dense cytoplasm are filled with food reserves and represent the survival mechanism for this algae-like, prokaryotic, photosynthetic bacterium. Akinetes can survive for years under dark and dry conditions, while the active vegetative cells die in a few weeks. Cylindospermum appears to be distributed at least focally on all continents, appearing as mats in clean water, in soil or on water plants. It is the subject of some study at present, and species designations are being evaluated by cytogenetic analysis. Note: Reading discussions on the evolution of life tends to make us think of “primitive” cyanobacterium/”blue-green algae” as organisms that existed long ago. It is important to remember that they are one of the most common life forms in the present day, thrive in every body of water, live happily within rocks and places thought inhospitable to life, form blooms off Fiji that can be seen from space, and travel to work with you every day in your car and lunch box. 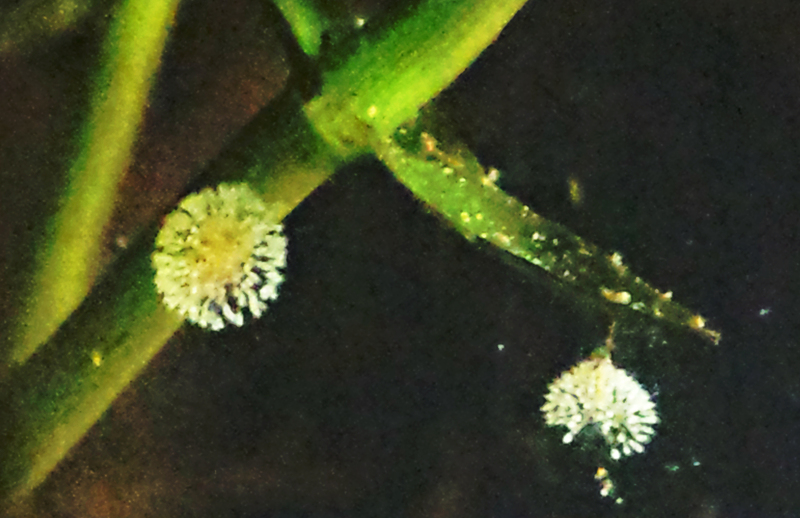 One ditch specimen contained a fascinating organism: Peranema. A not uncommon organism, Peranema has been studied for its method of locomotion, its feeding behaviour, and the fact that it responds to light by means of the same pigment found in our own retinas: rhodopsin. 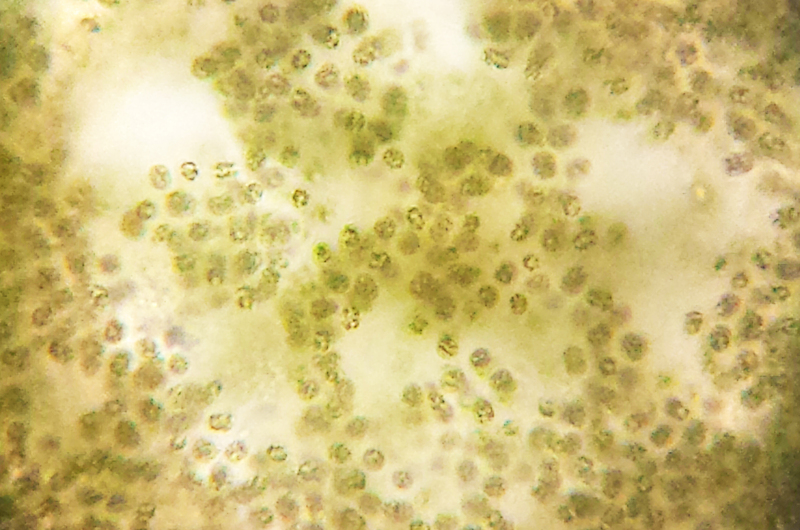 Though lacking chloroplasts, it is related to the green Euglena. ….mature cells are pulled forward along a surface by the cell surface motility of the proximal five-sixths of the anterior cilium. The cilium is straight except for the waving anterior one-sixth, which presumably senses particles of food and obstacles (my italics). 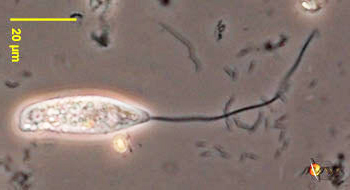 A second thinner cilium runs posteriorly and tightly appressed to the cell body, lying between the cell body and gliding surface, and is rarely visible under the light microscope. Apparently, the thin cilium does not participate in driving the cell forward. The cells are in sufficient contact with the surface to not rotate as they glide. 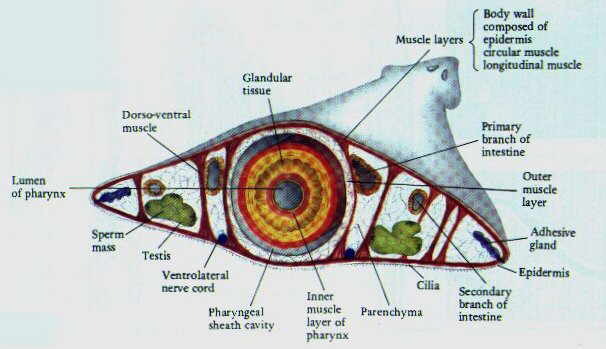 In order to turn, the cell body curves and then straightens with its cilium pointing toward its new direction. The cells also curl their bodies into a ball, with fast beating and waving of their cilia, when they eat….. Mature Peranema cells glide, turn, and curl spontaneously in either light or dark. A movie of the curling can be seen at the Euglenoid Project website (http://www.plantbiology.msu.edu/triemer/Euglena/movies.htg/peranem2.mov). As originally noted by Shettles, the frequency of curling behavior is apparently enhanced by an increase in light, as shown by a shortening of the time before the next curl. 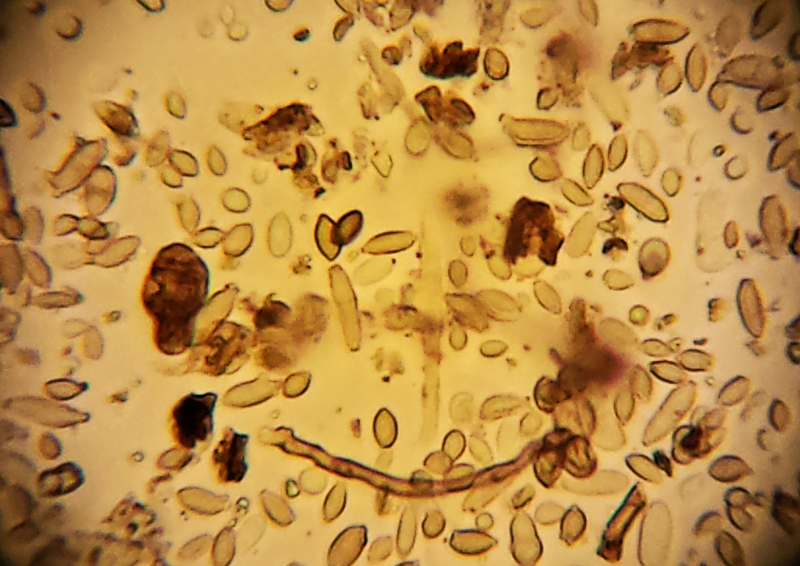 Shettles mapped the location of photosensitivity to the primary cilium and the front half of the body. 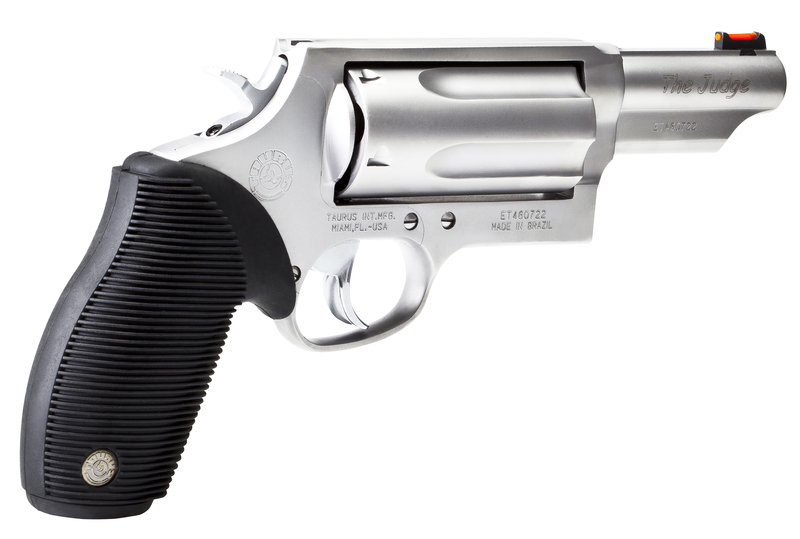 “The cell is spindle or cigar-shaped, somewhat pointed at the anterior end. It has a pellicle with finely-ridged microtubules (a structure often referred to as “pellicle strips”) arranged in a helical fashion around the body … the spiraling microtubular strips are able to slide past one another, giving the organism an extremely plastic and changeable body shape. 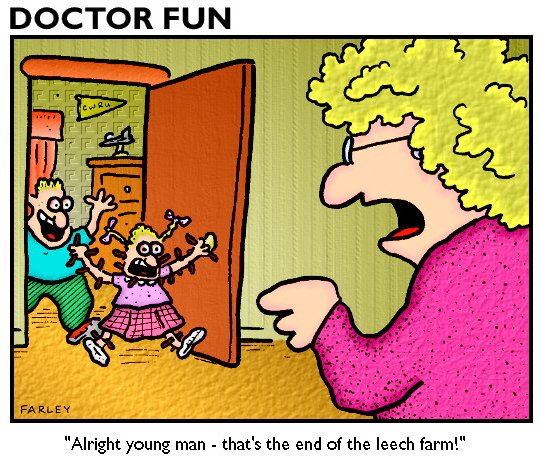 This permits a type of squirming motility, sometimes referred to as “Euglenoid movement” or metaboly…. When it is not swimming, Peranema can creep along by metaboly, progressing with wavelike contractions of the body, reminiscent of peristalsis. At the anterior of the cell, there is a narrow aperture, opening into a flask-shaped “reservoir”, from which the organism’s two flagella emerge. At the bottom of this reservoir lie the basal bodies (centrioles) to which the flagella are attached. One flagellum is relatively long and conspicuous, and when the Peranema is swimming it is held stiffly in front. At the tip of the flagellum, a short segment beats and flails in a rhythmic manner, causing the Peranema to move forward through the water with a calm, gliding motion. Peranama usually swims belly-down, without rotating. The second flagellum is difficult to see with bright field microscopy, and was entirely overlooked by early observers. It emerges from the same reservoir as the larger propulsive flagellum, but turns toward the posterior. It does not float freely, like the trailing flagella of Dinema and Entosiphon, but adheres to the outside of the cell membrane, in a groove along its ventral surface. Next to the reservoir, lies Peranema’s highly developed feeding apparatus, a cytostomal sac supported on one side by a pair of rigid rods, fused together at the forward end. The use of this “rod-organ” in feeding has attracted considerable scholarly interest. 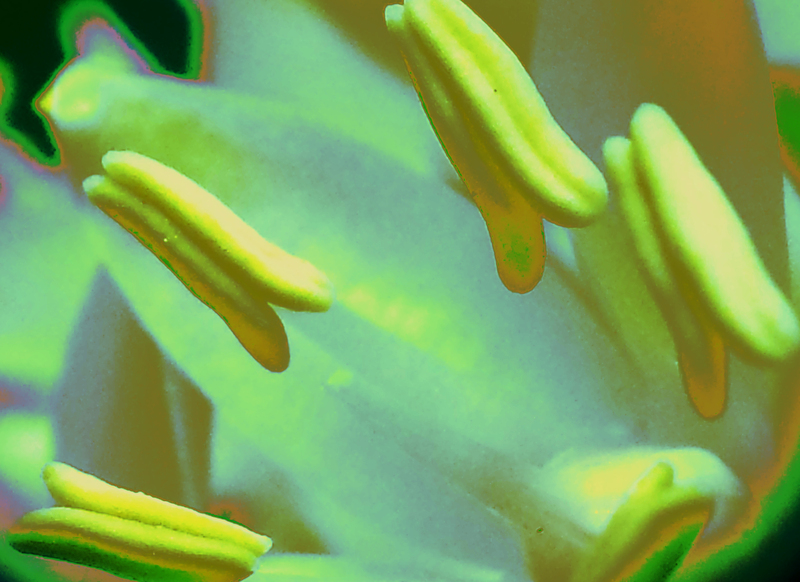 Some early researchers speculated that it might assist Peranema in tearing up and consuming its food; while others held that it was actually a tubular construction, serving as a cytopharynx. In 1950, Y. T. Chen accurately identified it as a structure separate from the reservoir, which could be used by Peranama to cut and pierce its prey … Nisbet questioned this, on the grounds that, when examined closely with an electron microscope, the rod-organ is blunt, and therefore an improbable instrument for either cutting or piercing. Since the rod-organ had been seen to move back and forth during feeding, Nisbet argued that its primary function is to create suction, drawing prey into the cytostome. So much to learn from a teaspoon of ditch water!